Dawson recently learned how to use the computer mouse and now enjoys playing computer games more than ever. He knows to click on the "e" to get to the Internet and is able to click on "favorites" and find whichever game site he wants to explore. His current favorite is Playhouse Disney, where he enjoys playing Mickey Mouse and Little Einsteins games. 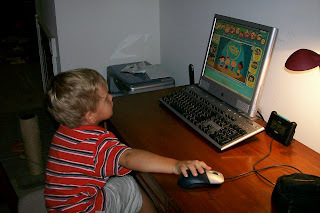 He also enjoys Starfall and Fisher Price Online Learning Games, both of which have great games for toddlers.